At the preschool, the children practice yoga for up to 30 minutes twice a week. Yoga for preschool children can help them develop body awareness, strength, language, good listening skills, cooperation and powers of observation. Yoga teaches the children about nature, their environment and it gives inspiration to their imagination. They learn by playing, singing, moving and storytelling. Yoga poses are the basic elements of the yoga practice. Yoga poses help children build body awareness and a positive body image. It helps children to build fine motor skills, coordination, muscle control, balance and endurance. Yoga helps with self-awareness, children who practice yoga learn early on to tune into their bodies. Self-esteem is boosted as the children gain control over their bodies and minds. In class, the children are asked to do poses based on nature. They might assume the poses of a snake, a dog or a tree. They are asked to imagine what it would be like to be those life forms. In this way, the children learn to connect with all life on the planet. Children can easily follow the teacher’s instructions by learning the names of different body parts, their locations and function. As children learn the names of the poses and movements, they develop a yoga vocabulary. They can use their yoga poses to play games, take on the qualities of different animals or use their imaginations to make up stories about animals on a farm, climbing on a mountain or trekking through a jungle. Their yoga improves very quickly. Children experience many of the same physical benefits adults do from practicing yoga. Yoga strengthens them and helps them to become more flexible and coordinated. The games and various poses develop children’s flexibility, strength, balance and posture. The relaxation part helps children to understand how to relax the body. Yoga helps to balance children’s energy level. Many of the yoga poses and games give children a better understanding of how their bodies work and move. Develop awareness of the senses. Build social skills by working together in yoga poses and games. Yoga helps the children to pay attention to each other, through making them more considerate of others. Children become more considerate of each other through poses and games that require them to pay attention to others. 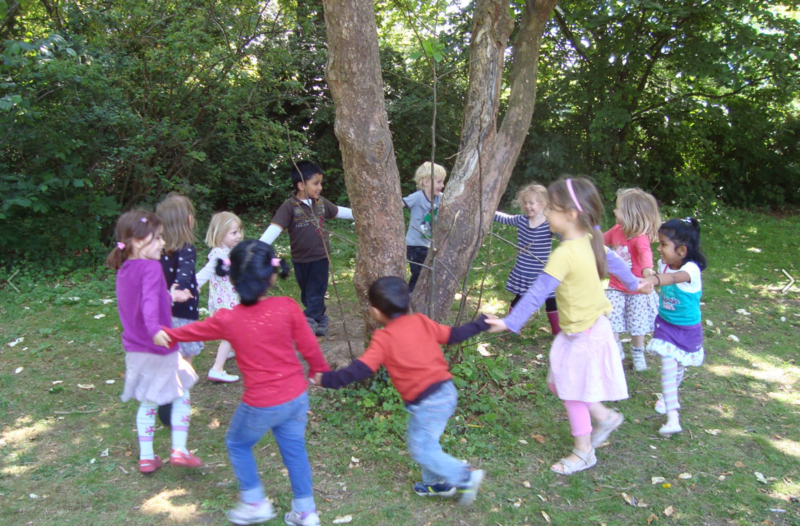 Invite the children to invent poses and movements and display them to each other. This helps them gain self confidence and discover creativity. Our teachers and assistants are inspired by our monthly theme to develop different art activities for the children. These range from painting, craft activities, model-making, and much more. We have various instruments at the preschool from different parts of the world and once a week the children do rhythm exercises and sing songs while playing an instrument and experimenting with different sounds and tones. This is a time to move our bodies and learn dances from different styles and for different children’s songs. Dance takes place once a week in the afternoon. Every morning, we have circle time when the children learn new songs, learn the date and talk about the weather, the season and the month, among other things. Good morning, good morning, I’m fine how are you? Friday, Saturday (repeat one more time). Is it sunny, is it cloudy, is it rainy out today? Is it windy, is it snowy, is it hot or cold today? Here is also a list of songs that we will sing throughout the year.